Recipes | The Catskill Distilling Co.
Stir. Shake. 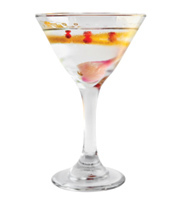 Serve in a martini glass, garnished with peach slice. Squeeze of fresh lime, shaken and poured into a martini glass. *Honey Syrup- Equal Parts honey and water brought to a boil and let simmer until honey is dissolved in water (about 15 minutes).